CBC president Hubert Lacroix is asking the federal broadcast regulator for more flexibility to grapples with the new digital universe, as hearings into the renewal of CBC's licence get underway. The CBC is asking the federal broadcast regulator for more flexibility as it grapples with the new digital universe. 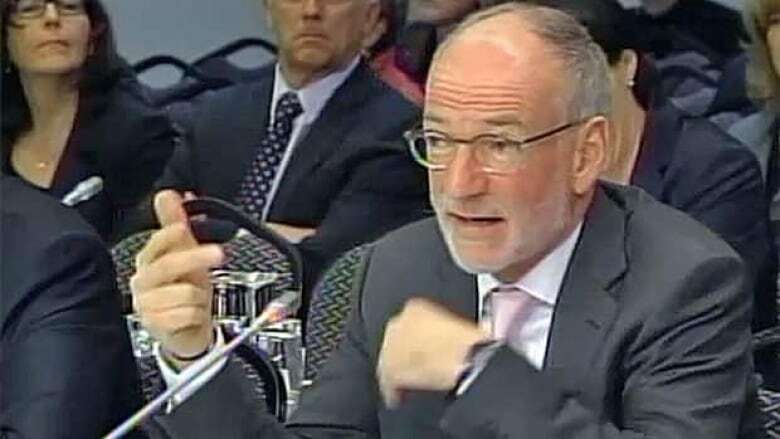 The strict regulatory shackles of the past don't work in today's fast-moving environment, CBC president Hubert Lacroix told a Canadian Radio-television and Telecommunications Commission hearing Monday. "We are pleased to make serious regulatory commitments, but we want them to make sense in the current — and in the future — environment," Lacroix said. The CBC wants to avoid having to return to the commission "every time we need to change what we are doing in order to serve Canadians properly," he said. Watch the hearings live on CPAC (note: this is an external link). Read opening remarks from the CBC's corporate panel. Read opening remarks by CRTC Commissioner Jean-Pierre Blais here (note: external link). For instance, young people are shunning television sets for computers, a shift that has prompted the CBC to move its children's programming online. Critics, however, say allowing CBC additional slack will mean less distinctive content and more commercials, making the public broadcaster indistinguishable from its private-sector competitors. Lacroix said the CBC aims to provide Canadians with programming that helps shape a shared national consciousness and identity, citing the Olympics, historical documentaries and homegrown drama. The broadcaster is seeking five-year licence renewals for its various television and radio services. As the two-week commission hearing began, the public broadcaster said much had changed since its last substantive renewal application 13 years ago. The digital revolution has transformed the way the CBC and other broadcasters deliver news, music and entertainment programming. At the same time, the CBC is struggling to absorb a three-year, $115-million cut to its budget of more than $1 billion. The broadcaster is also dealing with other financial pressures and faces the possible loss of lucrative broadcasting rights for NHL games. Lacroix said audience tastes and habits change rapidly and it makes no sense for the CBC to make commitments — airing a certain number of hours of programming in a particular genre, for instance — when it's not financially sustainable. "The financial challenges we face are daunting," he said. "But we will meet them. And we will balance our budgets. So, we cannot and will not make commitments that we know we may not be able to fulfil. "What we can do is make very serious commitments with respect to key objectives. But we need flexibility. And that is what we have proposed." CRTC chairman Jean-Pierre Blais questioned the wisdom of loosening the CBC's regulatory obligations, saying firm commitments may be "the nature of the beast" in terms of meeting the expectations of Canadians. The CBC proposes to devote 75 per cent of the broadcasting day and 80 per cent of prime time to Canadian programming on its English-language TV network. That would represent a dip from the current 80-per-cent Canadian content level during the broadcasting day. In addition, the corporation has requested permission to introduce ads to secondary radio services CBC Radio 2 and Espace musique to make up for funding losses. Lobby group Friends of Canadian Broadcasting said in a news release that would soon lead to commercials on the broadcaster's main radio services. "The move towards more commercialization will turn CBC into a private broadcaster which loses $1 billion a year rather than the public broadcaster that Canadians rely upon for credible news and Canadian entertainment," said group spokesman Ian Morrison.